When Bryan Singer's Superman Returns failed to ignite audiences, Warner Bros made the decision to abandon a planned sequel and focus instead on rebooting the Superman franchise altogether. Thanks to the huge success of Christopher Nolan's Dark Knight trilogy, they went with Nolan as producer and Dark Knight co-writer David Goyer. To direct they signed on Zack Snyder, who had delivered a robust hit for the studio with 300 as well as the much less successful Watchmen. That was an interesting combination, since Nolan is by-and-large a stunning director but Snyder is - in my opinion at any rate - not. The resulting film is a strange cross between the two men's styles. In some places it is jaw-dropping. In others it is also jaw-dropping - just for the opposite reasons. When I watched it for the first time I figured it was deeply flawed but overall fairly entertaining. When I watched it for the second time I decided I had been too easy on it, and that it was basically a flat-out bad film. Now on the third go, I am somewhere in between. There is a good movie buried in there, but it definitely is buried beneath a pile of poor story choices, visual excess, and a weird sense of embarrassment about being a Superman film. 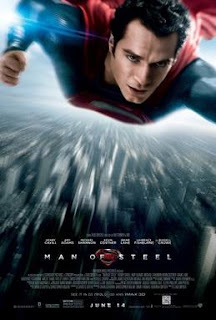 There are really two ways of looking at a film like Man of Steel: you can judge it on how it performs as an action-oriented science fiction film, and you can judge it on how it performs as an adaptation of the Superman character. As a Superman film it plays remarkably fast and loose with a lot of the details. A lot of it is additional story points and a slightly changed origin, with Superman's (Henry Cavill) fate tied largely to a genetic 'codex' that his father (Russell Crowe) implanted in his cells before sending him away from the planet Krypton. Lois Lane (Amy Adams) knows that Superman and Clark Kent are the same person, rather sensibly because she is a talented journalist and finding out these things is basically her job. Critically the film holds off on Clark making the decision to become Superman and help the human race until comparatively late in the day. He is a more reactive character than the version played by Christopher Reeve and Brandon Routh. Much of this hesitation comes from his adoptive father Jonathan Kent (Kevin Costner), who urges Clark to keep his powers a secret - even at the cost of letting innocent people die. It is this change that hurts the most. Jonathan Kent has always been a powerful influence on Clark, giving him his moral centre and drive to help others. That this version is the near-opposite of that feels like a rather nasty betrayal of what makes Superman great. Then there is the violence. I have always seen Superman as a man who minimises harm. Sure he will have a fistfight with a giant robot or a super-powered alien, but he will go out of his way to have that fight where in and such a fashion as innocent civilians don't come to harm. That does not seem the case here, with a Metropolis-set finale between Superman and General Zod (Michael Shannon) that levels entire city blocks and kills what much without exaggeration be something in the region of a hundred thousand innocent people. To cap it all off, the scene ends with Superman snapping Zod's neck and killing him stone dead. Now Superman has killed before. He's even killed in the movies before, with the previous Zod and his buddies tossed into a fog-filled crevasse at the end of Superman II. The difference seems to be the way one film abstractly sneaks it past the audience and the other just showcases it in a bluntly horrible way. It's certainly effective, but it makes for a very poor Superman. The film seems actively awkward about the fact that it's a Superman movie. It presents a semi-realistic take on the character, but then backs off any time something comes up that might challenge that realistic setting. I may be wrong, but I am pretty sure Superman only gets named once - and even then it's by a soldier in a communications room. The costume is given a bunch of changes, including a much darker colour scheme and an overly long cape. It also shies away from embracing Superman as the 'big blue boy scout' that pretty much defines the character. It is maybe the most subtle of the changes, but ultimately the most damaging: Superman just doesn't completely feel like Superman. One big problem the film has is that it never gives him a chance to be Superman. Sure he fights the villains, and flies around, and uses his various powers, but there is never a moment for the audience to simply see him be the character we all know him to be. Richard Donner's film did this perfectly, with a series of scenes showing Superman's first night of fighting crime across Metropolis. Even Singer's ill-advised sequel gives itself a moment for Superman to stop an armed robbery. In this film he pretty much hides until Zod arrives to capture and kill him, and so he defends himself as much as he protects the Earth. Putting the adaptation issues aside, there is plenty that works well in this movie. The opening 15 minutes, set on Krypton and starring Russell Crowe as the scientist Jor-El, is a sensational mini-action movie. It is beautifully designed and paced, and Crowe plays the role brilliantly. I would happily pay money to see a Jor-El prequel, and I hate prequels. Elsewhere the action scenes are beautifully staged. While it may not work as a Superman action sequence, the devastating duel between Zod and Superman is visually striking and really does express just how destructive this sort of super-powered fist-fight could be. The film's design work is very strong as well, with a lot of thought given to a Kryptonian aesthetic derived from the Superman logo. Henry Cavill is a great Clark Kent and Superman, and thankfully has a very different style to him than Christopher Reeve. Michael Shannon is also strong as Zod, although it's a growling militaristic version of the character that I do not find outrageously appealing. One nice element of the film is how well it surrounds the leads with strong supporting characters and actors, whether it's Crowe's Jor-El, or Costner's Jonathan Kent, or Diane Lane's Martha Kent. West Wing alum Richard Schiff has a nice role as a scientist, as does Christopher Meloni as a US colonel. Perhaps my favourite part of the entire film is Hans Zimmer's enormous, percussion-heavy score. It takes a lot to push the sound of John Williams' Superman theme out of the way, but Zimmer's score has the muscle to do it. In the end, however, there's just something weirdly off about this film. It does not feel enough like Superman. Its plot is a bit too unfocused and strangely paced. It tells Superman's origins in flashback, which gives it a strangely passive feel to the first act. It rushes through a series of settings and action beats in the second. It destroys half of a city in the third. Individual parts work, but overall Man of Steel is a bit of a strange off-kilter misfire. "a strangle off-kilter misfire" - a typo, I assume, but a disturbingly apt one, considering the topic.